André-Pierre ‘Dédé’ Rhem, 35 years old and a much loved member of the Chamonix Guides Company (Compagnie des Guides de Chamonix) has been killed by an avalanche on the glacier du Toula on the Italian side of Mont Blanc. Although an all-round mountaineer he was best known for his fantastic achievements on a snowboard and in particular his famous descent of the north face of the Triolet (Mont Blanc) in 1995 with Jérôme Ruby. He died today at 11h30 whilst descending a very steep couloir under the Point Helbronner. He was with three friends at 3,460 meters when he triggered a ‘slab’ avalanche which took him down the couloir which ended in cliffs. 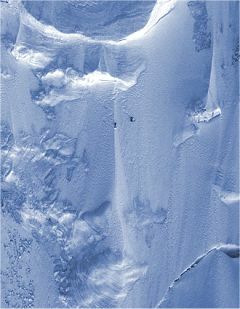 Earlier this season, Chamonix telemark guide Alain Géloen was killed by a slab avalanche on the Italian side of Mont Blanc. In an article on the ‘fallen of Chamonix’ in Le Monde last Sunday journalist Patricia Jolly wrote: “Dédé and Jérôme were at first regarded with circumspection by their peers, today, in their thirties they are the most respected guides, maybe because they knew when to take their feet of the gas pedal they are still around to tell us of their experiences of mountains.” Two days later Dédé was taken by the mountains he loved and grew up with.